with their existing 410 Winged Sprint Car classes. "Our goal for this Alternative 410 Motor Program was always to help get more competitors out there," said Danny Schatz, promoter of Red River Valley Speedway. "It's great to see organizations and tracks approving the use of these motors this year. We're all working towards building the future of our sport and hopefully their decision will add to their fields of cars." A prototype was tested in competition last summer. It was raced on a high-banked quarter-mile, flat 3/8 and half-mile dirt oval. The results did provide a positive reaction and proved to have the ability to be competitive with the current 410 motors. "Everyone knows that we are always looking to continue the growth and health of Sprint car racing," said Guy Webb, President of the All-Star Circuit of Champions. "As many of you know we've changed our championship structure trying to allow more opportunities for drivers. This engine package seems to have the same idea. There are a lot of racers out there and from an economic standpoint this option may work. They have come up with a program that should benefit everyone from drivers, car owners, promoters and the fans." The engine consists of specified number of components and recommended parts for both cost and uniformity. Engine builders will have some options in part choices as some are limited only by dimension, weight and material. The engine fits in the current Sprint car chassis with only minor changes. "We spent a lot of time trying to find a suitable alternative to help get some teams back out there racing," said Ron Shaver, President of Shaver Racing Engines. "This motor can be built by a lot of the same guys that are currently building the 410s. The A4MP will certify motor builders and make them accountable to uphold to the rules and regulations. Each motor will be sealed so that they can't be altered and have a serial number making it pretty easy for anyone to find out when and where it was built." The A4MP encourages any interested engine builders to become certified A4MP builders. Shaver Specialities and Schwanke Engines are currently certified builders of the motor. Details regarding certification and more specifications of the engine can be found by visiting the website: www.alternative410motor.com. 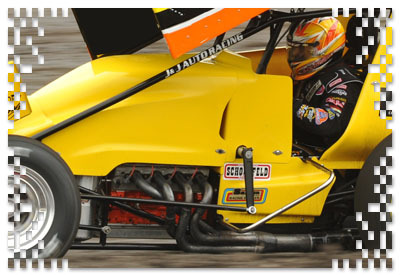 The Alternative 410 Motor group is excited that a number of organizations and tracks are considering legalizing this motor package for competition in 2011. Once confirmed, this site will list the places where these motors will be able to race. Contact information for the tracks and groups will also be available. The initial motor was built and tested at three different tracks: River Cites Speedway (Grand Forks, N.D.), a high banked quarter-mile track, Red River Valley Speedway (W. Fargo, N.D.), a semi-banked 3/8-mile oval, and Knoxville (Iowa) Raceway, a semi-banked half-mile. The motor competed in two weekly programs, an All-Star Circuit of Champions event and an International Invitational race during the Knoxville Nationals. The motor proved to be strong enough to be competitive at all three tracks. Questions? E-mail Danny Schatz with your questions in writing.